The Middle East and Africa (MEA) PC market continued to experience a steep decline during the third quarter of 2013, decreasing 15.0% in volume year on year, according to research firm International Data Corporation (IDC). The results, released in November 2013, showed that PC shipments into the Middle East, Africa, and Turkey region reached a total of 4.2 million units. As forecast, portable PCs declined at a faster rate than the overall market, with shipments down 17.8% year on year to total 2.5 million units, while desktops declined 10.4% year on year, with a total of 1.7 million units shipped. 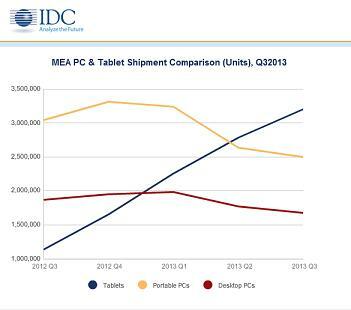 In contrast, the tablet market in the Middle East and Africa region grew 181.8% year on year in Q3 2013, reaching a total of 3.2 million units. Although Apple’s proprietary operating system, iOS, and Windows OS were contributors to this growth, the major contribution came without a doubt from the Android operating system, with a total of 2.39 million Android units shipped in the quarter. “We have witnessed a steady decline in the PC market as more and more people shift toward mobile devices, ranging from portable PCs to tablets and smartphones,” says said Adriana Rangel, research director for systems and infrastructure solutions at IDC Middle East, Africa, and Turkey. IDC’s research shows that the shifting of demand from PCs to other mobile devices is expected to continue acting as the primary inhibitor of PC demand throughout the forecast period. IDC is forecasting a further year-on-year decline of 14.4% during the final quarter of 2013. 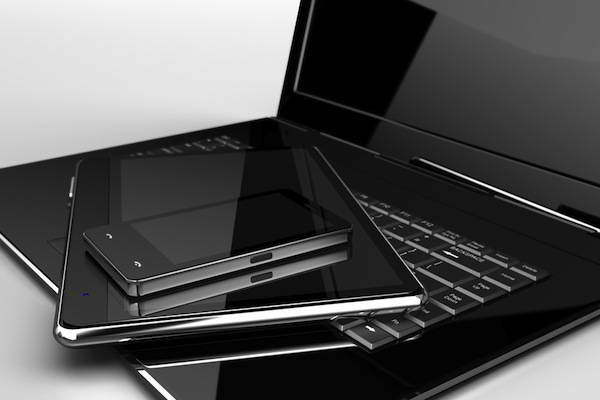 The same period is likely to see PC vendors placing a growing emphasis on their lighter and sleeker portable PC offerings, including ultra-slim notebooks and convertibles. HP maintained leadership of the overall regional PC market in Q3 2013. After suffering year-on-year declines for two consecutive quarters, the vendor finally managed to post positive growth of 7.4% during the third quarter of the year. Lenovo continued to attain the fastest growth rate among the region’s top PC vendors, with its shipments increasing 25.1% year on year, enabling it to claim the number-two position in the market. Dell dropped to third place after suffering an overall year-on-year decline in shipments of 16.4% on the back of a significantly steeper fall in the consumer space. Toshiba and Acer ranked fourth and fifth, respectively, with declines of 30.5% and 33.4% year on year. Both vendors have a significantly weaker presence in the commercial segment than the top three vendors. Samsung achieved strong growth during Q3 2013 to claim the region’s top spot for the first time, recording total shipments of 775,000 units in the process. Apple’s growth continues to be the slowest of the major tablet vendors, with shipments increasing just 1.6% to total 693,000 units. Lenovo held on to third spot, shipping 206,000 units in Q3 2013. The vendor has extremely aggressive plans for upcoming quarters. Acer ranked fourth with a total of 98,000 units. Casper, a local Turkish brand, re-entered the top-five rankings, filling fifth spot after shipping a total of 96,000 units, spurred by the company’s aggressive marketing promotions in the consumer segment. “Though iOS continues to lose share in the region, the launch of the iPad Air and iPad mini with Retina display should help the vendor grow in terms of units shipped over the forecast period,” says Fouad Rafiq Charakla, research manager for personal computing, systems, and infrastructure solutions at IDC Middle East, Africa, and Turkey. It is clear that tablets are witnessing growing demand from commercial end users, especially in the education sector. In Qatar, the second phase of the Supreme Education Council’s ‘e-bag’ project was rolled out in Q3 2013, with around 10,000 Windows-based tablets delivered during the third quarter. The project is expected to continue in the upcoming quarters. In Turkey, a deal for 31,000 Android tablets was won by General Mobile in the government segment. Other major deals are also expected to be completed in the next few quarters, including those with the Ministry of Education in Oman and the Ministry of Education in Egypt.